Antonello da Messina (ca. 1430–1479) was one of the most groundbreaking and influential painters of the quattrocento. His formation took place in Naples during the rule of Alfonso of Aragon, in a brilliant artistic climate open to French and Netherlandish painting. Antonello absorbed these influences, so much so that many of his near contemporaries believed he was the first to introduce the use of oil painting—already current in the North—in Italy. His trip to Venice in 1475 was a landmark occasion, and his great altarpiece for the church of San Cassiano there (now in fragmentary form in the Kunsthistorisches Museum, Vienna) redirected the art of Giovanni Bellini and other Venetian painters, while his portraits mark a new stage in the evolution of that genre in Italy. No greater artist emerged from southern Italy in the fifteenth century. The life of Antonello da Messina has been the subject of contradictory and often fanciful reconstructions during the course of the centuries. There are many reasons for such a complex critical appraisal, especially a lack of documentation overall combined with the fact that the surviving paintings are all concentrated in a particular period. While hardly anything has come down to us from the first two decades of this painter’s career, who we may suppose was already at work by 1450, his output was considerable in the 1470s, namely the last ten years of his life, which has contributed to the imbalance in the critical evaluation of his oeuvre. Antonello’s period in Venice, from 1475 to 1476, marked the definitive turning point in his artistic career and in fifteenth-century Italian art history. During his stay in Venice, which was brief but marked by a series of masterpieces each more stunning than the other, the Sicilian painter developed the Ecce Homo theme in works of remarkable emotional intensity that move the viewer by humanizing Christ’s suffering with agonized realistic details. There are five versions of the subject by Antonello. One in the Galleria Alberoni, Piacenza, bears a date that is usually read as 1473. One in the Metropolitan Museum of Art in New York. One formerly in the Ostrowski collection (disappeared from the Kunsthistorisches Museum, Vienna, during World War II) was dated 1474. 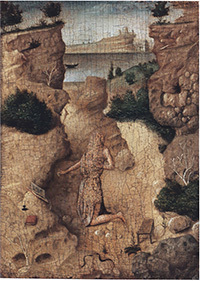 Two others are in the Galleria Nazionale di Palazzo Spinola, Genoa, and a private collection, New York (with a depiction of Saint Jerome in the Desert on the verso). A recently rediscovered, double-sided panel that may indeed be the artist's earliest Madonna and Child with a Praying Franciscan Donor and Ecce Homo, provides a fascinating vision into the artist's training and earliest years. The double-sided panel is now in the collection of the Museo Regionale di Messina. Christ Crowned with Thorns was in a collection in Palermo by the seventeenth century, when the date 1470 was recorded as appearing on the cartellino at the base. The date would make this the earliest extant version of a subject that Antonello treated frequently. Christ is shown bust-length, behind a parapet—a convention appropriated from portraiture and used to enhance the effect of his physical presence. 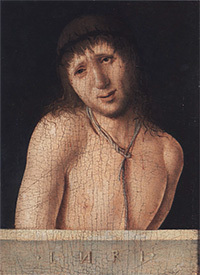 While the New York Ecce Homo , dated 1470, shows the intense sentimentalism typical of the Flemish interpretation of the subject, the one from Piacenza, executed in 1475, reveals the change that occurred after his contact with the artistic scene in Venice, when he began to acquire a dramatic and expressive force so strong as to influence later painters. Rediscovered in 2003, a double-faced painting provides a fascinating vision into the artist's training and earliest years. The two small private devotional works from Messina and New York, which are painted on both sides and appear worn with use, are characterized by an expert descriptive skill that is almost miniaturist, especially the very intense Ecce Homo from New York (recto). These paintings, though so small in size, reveal Antonello's masterly art in capturing profound emotions through a penetrating study of reality. An image of the Madonna and Child with a Praying Franciscan Donor graces the recto (front) side of one panel. In this early work, recently conserved, the Virgin Mary holds the Christ Child above a Franciscan monk. The infant Jesus extends his right hand in a gentle gesture of blessing to the friar, who is painted in strict profile, typical of many donor portraits of the Italian Renaissance. The three figures stand out against a dark background. They are separated from the viewer by a lower parapet. It creates a sacred space in which the three holy figures interact with each other. The crisp crimson folds of the Virgin Mary's mantle are derived from Antonello's possible exposure to works by the French Provençal painter Enguerrand Quarton (ca. 1422-1466). An Ecce Homo or image of the sorrowful Christ's head is on the painting's verso or back side. The expression Ecce Homo (Latin for "Behold the Man") comes from the New Testament Gospel According to John (19:5). They were the words spoken by Pontius Pilate when he presented Jesus Christ, scourged and wearing a crown of thorns, to the crowd who sought his crucifixion. The small size of this devotional panel suggests its portability desired by the original owner, who may have carried it during his travels in a special leather case. Probably born around 1431, Antonello’s artistic career began in the lively cultural climate of the Aragonese court in Naples, at that time one of the centres of the Mediterranean civilization. The painter Colantino was active in this city at the time, and it was in his workshop that Antonello did his early training, receptive to the many stimuli offered by an environment in which Catalan and Provençal works were to be found, along with Northern- European masterpieces such as the extraordinary Lomellini Triptych by Jan van Eyck. His debut came with paintings like the Salting Madonna and the enigmatic Portrait of a Man, from Cefalù. These were followed, between 1473 and 1474, by works that were already fully mature, the two most important being the Annunciation from Syracuse, where the lighting effects in the intricate spatial composition are handled with complete mastery, and the Saint Gregory Polyptych, commissioned for the church of the Benedictine Convent of Santa Maria Outside the Walls, with its highly innovative psychological rendering of the figures. But it was Antonello’s period in Venice, from 1475 to 1476, which marked the definitive turning point in his artistic career and in fifteenth-century Italian art history. The encounter between Antonello’s art and the Venetian figurative environment, represented primarily by Giovanni Bellini, created the conditions necessary for absolute masterpieces, particularly portraits such as the so-called Condottiere in the Louvre or the male portraits held by the National Gallery in London and the Galleria Borghese in Rome. Here, the typically Flemish characteristics such as the three-quarter pose, the parapet separating the subject from the viewer, the trompe l’oeil cartellino and the dark ground, are combined with a psychological rendering made unique and groundbreaking by its profound insight. Antonello was immediately recognized as a great artist in Venice and received many prestigious commissions, including the one for the San Cassiano Altarpiece, painted in 1476 for the aristocrat Pietro Bon. This work immediately became famous for its wealth of precious details, and was executed in direct relation to contemporary works by Bellini. During his stay in Venice, which was brief but marked by a series of masterpieces each more stunning than the other, the Sicilian painter developed the Ecce Homo theme in works of remarkable emotional intensity that move the viewer by humanizing Christ’s suffering with agonized realistic details. He also painted such gems as the small panel of Saint Jerome in his Study, with its dazzling spatial composition and unusual setting of a Renaissance study in a church aisle immersed in penumbra, and the small votive panels of Crucifixions from Antwerp and London. A crescendo of formal innovations and an unprecedented degree of viewer involvement peak in the Virgin Annunciate, from Palermo, in which a maiden, enveloped in her mantle, both hieratic and conscious of her role in the history of humanity, makes time stand still with her raised hand, and casts the viewer as the annunciating angel. The Salvator Mundi from London, second only to the Virgin Annunciate for the spatial virtuosity in the representation of the hands, and the so-called Trivulzio Portrait from Turin, a truly fine example of the characterization in Antonellian portraits, in which the sitter captures the viewer with his hypnotic and wickedly challenging gaze, were executed in 1476. The Sicilian painter’s artistic career culminated in two exceptional works: the Saint Sebastian, from Dresden, commissioned during a plague epidemic, in which the master’s skill in creating perspective reaches its height in the Venetian cityscape, and the Pietà, from the Prado in Madrid, probably executed after his return to Sicily, since buildings that actually existed in Messina can be glimpsed in the background. On 14 February 1479 Antonello made his will, and died two months later. Thus ended an extraordinary artistic career in which converged with unusual consistency and intensity – like sunrays seen through a converging lens – the different cultural roots that intertwined in the Mediterranean during that period of splendour known as the fifteenth century. The ‘Antonello da Messina’ exhibition, scheduled at the Scuderie del Quirinale from 18 March to 25 June 2006, was a unique event, bringing together – for the first time in history – virtually all of Antonello’s paintings that have come down to us. The museum was conceived with the artwork, furnishings, ceramics, silver, books and etchings which the marquis Paolo and Franco Spinola donated in 1958 to the Italian State together with the centuried family mansion of which the aforementioned constituted patrimony. This page uses material from the Wikipedia articles Antonello da Messina and Ecce Homo published under the GNU Free Documentation License.